Judy West posts a Celtic challenge every two weeks. I usually don't manage to participate, but #31 appealed because I'd have a sampler showing a good selection of tangles that are linear, for thin places and border ideas. FORTY tangles in fact! It will be a handy reference. 'Official' Zentangle tangles are GREEN. Tangles that I designed myself are RED. Tangles that other people have designed are BLUE. 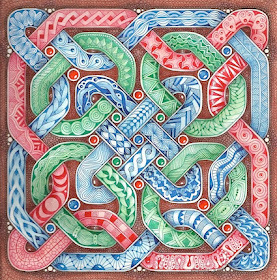 'Official' Zentangle tangles : Avreal, Betweed, Chainging, Finery, Knase, Meer, Quib, Rain, Snail, Vega, Xyp, Zander (and Hibred, which is in blue). Tangles that I designed : Chebucto, Copada, Ionic, Lamar, Many Moons, Prestwood, Seljuk, Zedbra as well as Ninja Stars and Screen, both of which are not linear tangles, but most square grid tangles can be used as a single row to make a linear pattern. Plus, of course, Black Pearlz; I can hardly do a piece without those! Tangles that other people designed : Adente, Blake, Coaster, C-scape, Diamond Drops, Elven, Firecracker, Flez, Fohbraid, Japonica, Kandysnake, Paisley Boa, Puffle, Ragz, Snugz, Unyun, Wud, and Zewm and Hibred together in one section. Super, and such a great pattern keeper! what an excellent idea! i may have to print it out and put it in my notebook! What a fabulous beautiful piece! 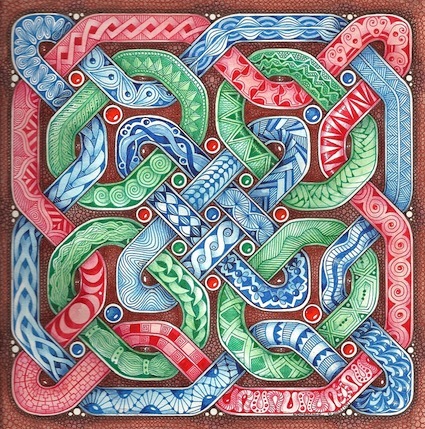 I love Celtic knots and to be able to work such a complicated artwork is amazing! This is absolutely stunning ... brilliant idea to color-code the tangles by artist ... you are such a wonder!! Thanks for all you do! WOW Margaret this is really beautiful and to organize the patterns according to colour very smart. Wow - if you ever decide to put this out as a print, I'd buy one! Beautiful sampler and a really great reference for linear patterns! Thanks for sharing...this one will be printed! Beautiful and a great reference. Brilliant idea using the colors as a built-in key. Wow, wow, wow! This is such a beautiful piece and a wonderful reference to boot! Thanks so much for sharing. Margaret your Celtic knot sampler is luxurious with grace and glamour! Wow! beautiful and I love the color key! Absolutely stunning! What a excellent idea! Love it! I love your process in creating this piece. Oh My! This is spectacular! I love that you color coded the tangles too. If you don't mind, I'd love to try this myself. I'm part Scottish and would love to have something like this hanging in my home. Thanks for sharing! This is beautiful, the colours are so great and all the interesting patterns.